Director of the Central Intelligence Agency, John O. Brennan, has touched on the instability and transnational threats to global security at a meeting of the Council on Foreign Relations. During this lengthy talk, the topics that were touched on specifically were the threats to the US interests and how the CIA created ISIL/ISIS threat is greatly impacting the world. Brennan also brought up the topic of geoengineering. 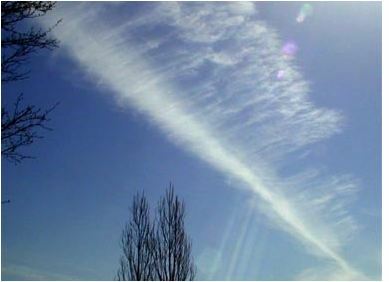 Geoengineering is the issue of intentionally manipulating an environment process that affects the earth's climate to fight against the issue and effects of global warming. Proceeding towards SAI would create a large number of problems for the government, despite a large amount of good is capable of. SAI would have to work together with greenhouse gas emission reduction to help address other climate change effects such as ocean acidification because SAI alone is not capable of removing greenhouse gases from the atmosphere. CIA continually and covertedly funds actions against this country! WHY is the group allowed to continue their assassination against America with the support of the "tax credit" hounds called CORPORATIONS? 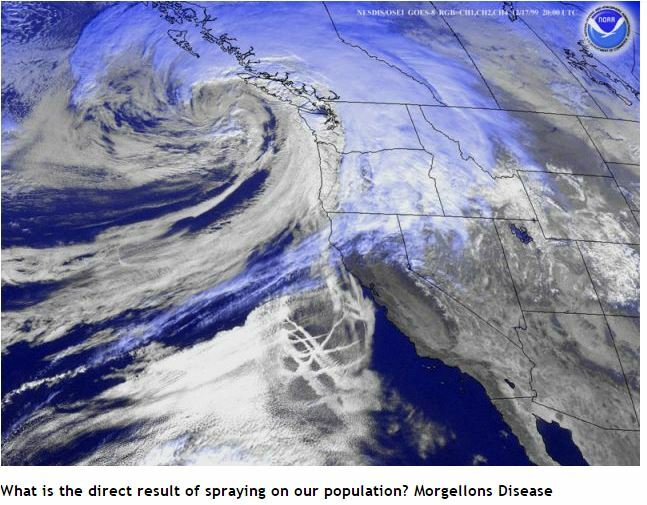 The CIA covertly funds and promotes the global spraying program, also known as geoengineering or chemtrails, and may refuse to stop even if President Trump demands it. 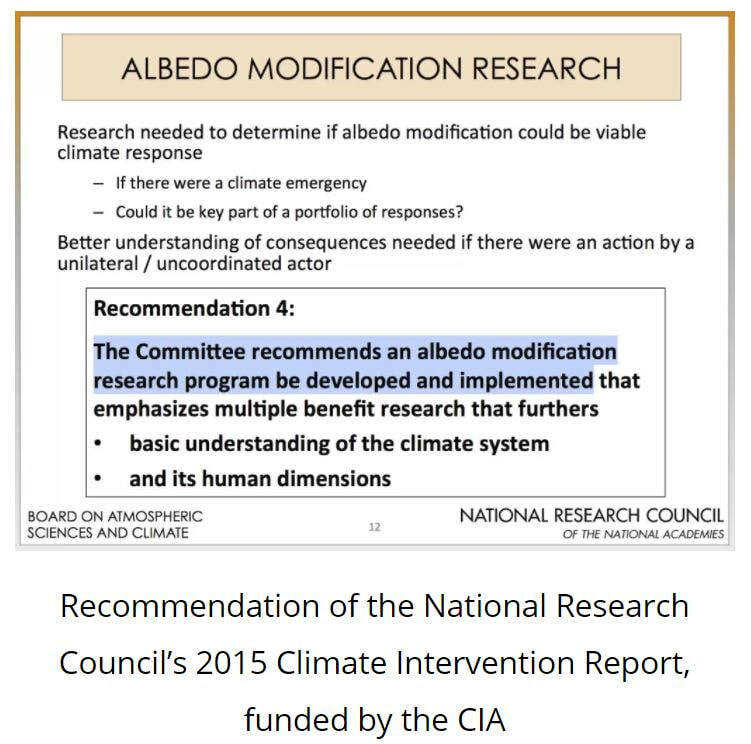 The rogue agency covertly funded a report recommending the spraying program “be developed and implemented,” admitted geoengineer Alan Robock at the Paris Climate Conference in July 2015. The South Coast Air Quality Management District tentatively identifies the powder wafting down from the sky as “cedar pollen.” But a biologist retorts that December is not the season when cedar pollen normally appears. And when pollen appears in the spring, it does not “explode.” Several witnesses saw a yellow cloud “exploding” in the skies over the Lake Arrowhead area. According to a press story, community after community continue to report that hundreds of people are becoming ill at the same time-usually following heavy chemtrail activity. Three physicians report an increasing number of patients being seen for similar illness. Pharmacist Ed Burrows is sick himself. Since early December he has been suffering from a respiratory ailment that has includes a “gooey phlegm” that, despite his best efforts, he has been unable to relieve. Burrows said the issue is raising “high concern” for him that his health may be “jeopardized.” Burrows says he “feels that it is directly related” to recent chemtrail activity. CHEMTRAILS BASES IDENTIFIED: Las Vegas reporter Marcus Dalton writes that an archeologist working throughout Nevada began noticing “all white unmarked aircraft” preparing for take-off at Nellis AFB, and at the Mancamp Complex near Tonopah in the late-90s. The white planes have also been spotted at a former AFB near Phoenix, and at the previously closedGeorge AFB in the Mojave Desert. One correspondent claims to have personally seen the spray planes taking off from and landing atMcGuire AFB in New Jersey. Active in the Canadian military “since my birth,” Bryan says, “What I have noticed is that unusual trails have been coming from white USAF KC-135s heading to Shiloh, Alaska. Guaranteed Morgellons Disease Treatment You are here to find a solution to your Morgellons infection. You have found it. NutraSilver simply works and we guarantee that for 60 days. Do not suffer another day. There is no risk to you because your results are guaranteed. Morgellons done. Here is Connie’s story and how she conquered Morgellons disease using NutraSilver. THIS VIDEO MENTIONS THIS REPORT - WEATHER on a FORCE MULTIPLIER: OWNING THE WEATHER 2025 - US AIR FORCE REPORT! NASA Sounding Rocket Daytime Dynamo Launch Postponed! The launch of two sounding rockets from the Wallops Flight Facility was scrubbed on Wednesday, July 3 due to poor weather in the area. The next attempt for these two rockets will be Thursday, July 4, with a window of 9:30-11:30 a.m. The two rockets, a Black Brant V and a Terrier-Improved Orion, will launch 15-seconds apart in support of the Daytime Dynamo experiment, which is a joint project between NASA and the Japan Aerospace Exploration Agency, or JAXA. The project is designed to study a global electrical current called the dynamo, which sweeps through the ionosphere. The ionosphere stretches from about 30 to 600 miles above Earth and plays a crucial role in our day-to-day lives. For example, radio waves bounce off it as they travel from sender to receiver, and communications signals from satellites travel through it as well. A disruption in the ionosphere candisrupt these signals. The first rocket scheduled for launch is a single-stage Black Brant V, which will collect data on the neutral and charged particles it travels through. The second rocket is a two-stage Terrier-Improved Orion. It will shoot out a long trail of lithium gas to track how the upper atmospheric wind varies with altitude. These winds are believed to be the drivers of the dynamo currents. Since the launch is during the day, the lithium trails will not be highly visible to the naked eye. July 4, 2013 11:40 AM. Aluminum, a phosphides is a highly effective insecticide and acute poisoning with this compound may be due to ingestion of indirect from accidental inhalation of phosphine. It inhibits oxidative respiration by 70%, profound circulatory collapse, is secondary to factors including direct effects on cardiac myocytes, fluid loss, and adrenal gland damage and in addition, phosphine and phosphides have corrosive actions. There is no antidote to phosphine or metal phosphide poisoning and many patients die despite intensive care. Never take when pregnant! Never break open the capsules! early signs of lithium toxicity, such as nausea, vomiting, diarrhea, drowsiness, muscle weakness, tremor, lack of coordination, blurred vision, or ringing in your ears. Drink extra fluids to keep from getting dehydrated while you are taking this medication. Tell your doctor if you have been sweating excessively, or if you are sick with fever, vomiting, or diarrhea. Lithium can cause side effects that may impair your thinking or reactions.